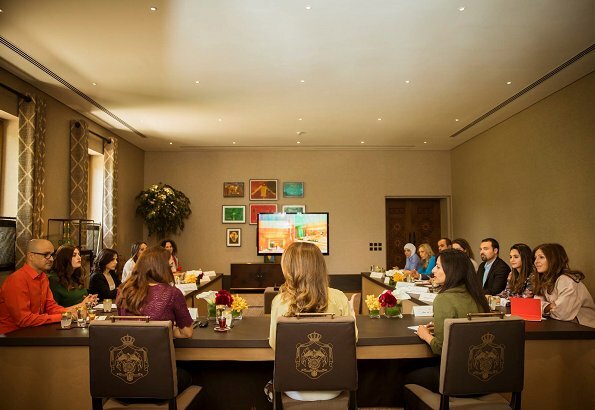 Queen Rania of Jordan met with the Amman Design Week 2017 (ADW) team for an update on new programs. Amman Design Week 2017, whose main exhibition will be held at the Ras Al Ain Hangar Gallery, will comprise the second edition of the annual program. This year’s event will offer a nine-day comprehensive program, commencing on the 6th of October and ending on the 14th of October. Her style: maybe it's the white trousers giving me the pain? She seems to like blouses with strange asymmetrical necklines. Not everyone has wrinkled foreheads. I don't know how old Queen Rania is, but I am in my late 40s and I don't have many wrinkles or lines. It's alright - don't likecthe combination of the blouse colour and the white trousers. I like her shoes and her hair looks nice.